It's a case that combines history and mystery--and very valuable gold coins. The stakes were certainly high: One of these rare $20 pieces sold for a record $7.59 million in 2002. Here's the story. A jury decided that a Philadelphia woman, Joan Langbord, who found the coins in her father's bank deposit box, never should have owned them, and that the U.S. government was right to take them back. The government argued that the never-circulated gold coins should never have been anywhere outside the U.S. Mint. Only a half-million of the coins were made. 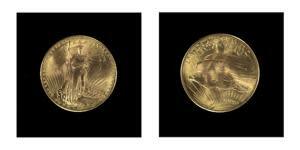 The rare "double eagle" coins, designed by sculptor August Saint-Gaudens, are fervently sought by collectors—and worth a mint. When the United States abolished the gold standard in 1933, most of the pieces were melted down. Two were sent to the Smithsonian, and 20 disappeared—the very 20 that can be traced to Langbord's father, a Philadelphia jeweler named Israel Switt. In challenging Langbord's ownership rights, the government argued that the dollar coins were most likely stolen. Langbord, who is 81, argued that her father did business with the Mint, and the coins could have been acquired legally. But the government case seemed to sway the jury against Switt: The jeweler had been investigated for illegally possessing gold coins in the 1930s and '40s, but Switt was never prosecuted because the statute of limitations had expired. The Secret Service believed that Switt worked a shady deal with a cashier inside the U.S. Mint to acquire the coins, which are currently being held at Fort Knox.